Canada: A People's History calls upon the expertise of dozens of historians, archivists and specialists. 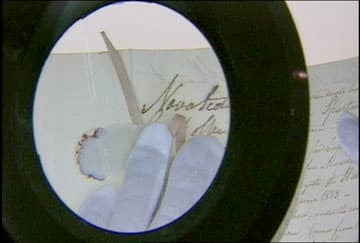 From tracking down diaries and letters, to identifying old photographs, to confirming the details of a specific event in Canadian history, the production teams consulted with experts and organizations across the country -- in addition to having a series researcher working on-site at The National Archives of Canada. Other organizations with rich online resources include The National Library of Canada, the Archives nationales du Québec, the Archives of Ontario and the Canadian Institute for Historical Microreproductions' Early Canadiana Online. A closer look The production team examined manuscripts, photographs, paintings and other documents at the National Archives of Canada, as well as many other resource centres.